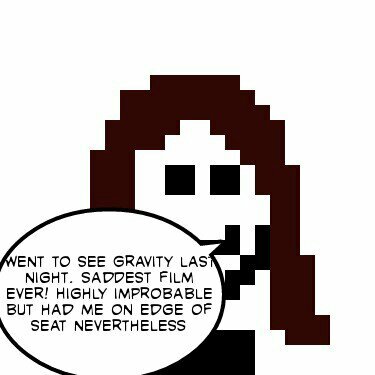 Gravity – Review in a Hurry – Screenkicker! Hey, it’s back! The second ever Review in a Hurry. This feature is great for really bad films that don’t deserve a full writeup like the last Review in a Hurry. However this time there’s a different reason. Gravity from acclaimed director Alfonso Cuaron was released on the 4th November in the UK. But for some strange reason it had already been released in America a month earlier. Basically we got the mediocre Thor: The Dark World early and the yanks got Gravity. This means you’ll most likely have seen a hundred reviews for Gravity and probably don’t need to read another one. Hence the Review in a Hurry. If you would like to submit a Review in a Hurry just drop me an email. I’ll even draw a super-realistic picture of you like the one above. I look forward to hearing from you potential reviewer! Previous Not So Super: Has the comic-book bubble finally burst? Next The Walking Dead – Why do I keep watching it? No really, why? Just saw it. It was ok, I enjoyed it enough. 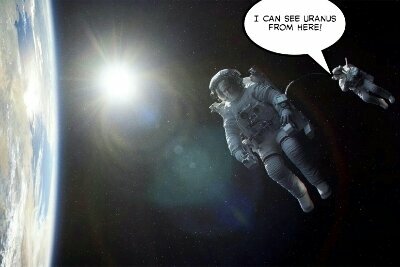 Reminded me of ‘open water’ but in space. Also reminded me that I still hate Bullock. Those darn yanks and their Gravity reviews. 😉 I’ll have you know, however, that this yank was quite jealous you got Thor first. I LOVE THIS PLAN. I actually spent a couple of days in Edinburgh once. I would sooooo come back. Fair warning though: I live in Indiana. We have…a lot of corn. Lol. Yeah I’d definitely take a trip to Indiana, even just to see a raccoon. Also you’d have to take me to see a movie and then we could argue about it! Yessss. Excellent. I will start setting raccoon traps now. Non-lethal traps, of course. Also, I live by wild turkeys. You will see soooo much nature! Lol. You’re a Midwest girl, too?! I had no idea! Where’s home? Hmmm. You’d certainly gain a different type of (disappointed) clientele…Hahaha. Hahaha, I never fail to disappoint! That’s funny – no one has ever asked in my year of blogging now it’s been twice in one day. 🙂 I’m from Wisconsin – been in England a decade now. We had plenty of corn too. Lol. And cheese! Nice review Mikey. Beautifully made, but a weakly-written. Oh well, at least they fall back on something worth paying attention to. Yeah I know you’re still crying about that!